Through extensive research and development, Power Adhesives have created a specialised adhesive formula dedicated to working with vacuum infused composites. Allowing customers to position and secure reinforcement materials during lay-up. Applied to a single surface using Power Adhesives Vactac spray tools, they provide an instant ‘high grab’ adhesive surface, while still allowing repositioning if necessary. Only once pushed firmly together, is the final adhesive bond made. 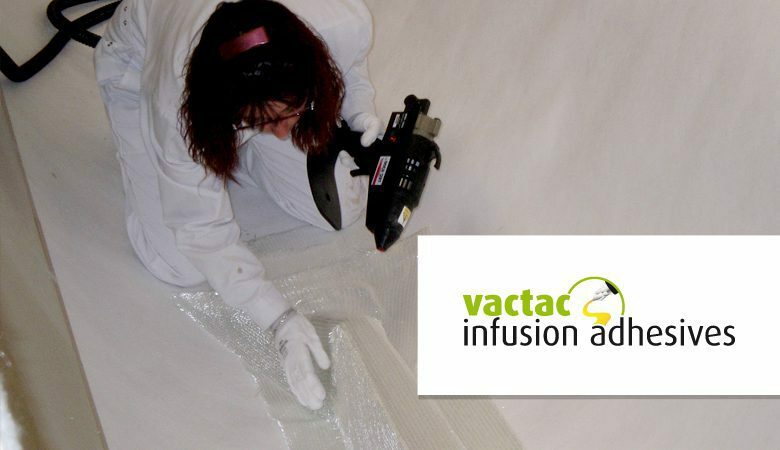 Benefits to the Vactac Vacuum Infusion Adhesive system include a higher instant tack than conventional methods, and zero wasted materials mean money isn’t being thrown away during production. The Vactac products boast an infinite shelf life, unlike volatile organic compound spray adhesives, and the range does not require specialist packaging, transportation or storage. Our vacuum infusion adhesive range removes the health and contamination problems usually associated with airborne particles from competitors adhesives, as well being completely solvent and water free. The vactac adhesives only go where intended, and therefore eliminate the worry of getting into the workplace or onto workwear.